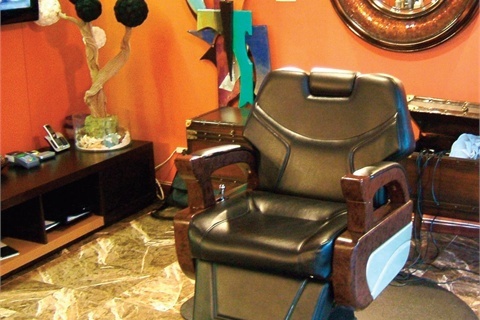 It’s always fun for me to check out salons that specifically cater to men. It takes a bit of the apprehension out of going to a salon when I know the majority of the clientele is male and that I won’t stand out as much. 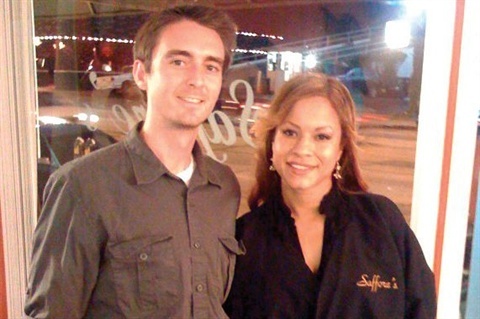 So when a friend told me about Saffore’s in West Hollywood, I immediately gave them a call. I scheduled a pedicure with the resident nail technician, and on the day of the appointment I braved hellacious Los Angeles traffic to get there. The salon lies right in the heart of Hollywood, on La Cienega and Sunset Boulevard, but has the feel of a small neighborhood barbershop. The decor is very welcoming, with barbers and clients chatting while they cut hair and a game plays on the big screen TV. I met my nail technician, Crystal Sierra, who led me to the back where a single pedicure chair is tucked next to the retail section. 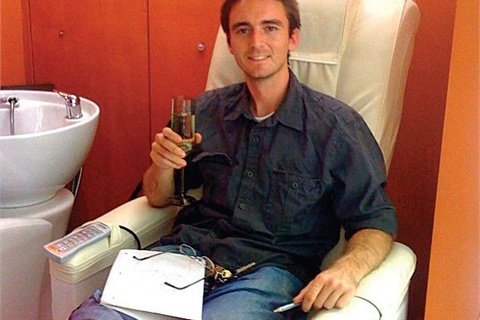 Crystal had already prepped the pedicure tub and offered me a glass of wine as I placed my feet in the warm water. 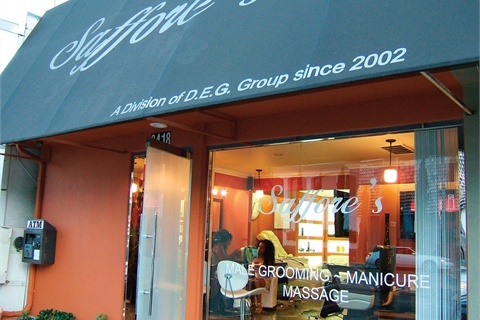 Saffore’s was started in 2003 when owner Tray Saffore opened the first salon near Beverly Hills. The second location on Sunset opened in April 2009. Crystal is the only full-time nail technician at the Sunset Saffore’s, and says that with the Hollywood clientele, you never know when an appointment will be made. “Sometimes a team will come in, or an entertainer and he’ll say he wants a quick mani/pedi before he goes out, so I’ll come whenever he wants, even after hours.” Saffore’s will often stay open late to accommodate appointments. Since it is near many clubs and bars, there are often customers getting quick touch-ups before a night on the town. But Saffore’s is not without its female clients too. Crystal says that about 20% of the clientele are women. Many of them are coming from local hotels and enjoy the change Saffore’s offers from their typical salon. Crystal did an amazing pedicure. She finished with a nice reflexology massage of the calves and feet using Biotone massage cream, which she says is her favorite. She also gave me a light buff on the toenails for a slight shine.